DJ Master is a music game where you take on the role of a DJ. It features over 40 songs, and is presented beautifully with a 32 inch widescreen LCD monitor. 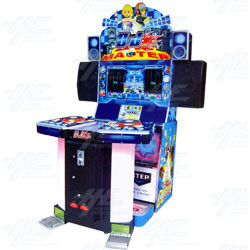 The game is suitable for 1 or 2 players, and is controlled by colourful buttons and a foot pedal. The game features 5 difficulty levels, with modes including single mode, PK mode, and cooperation mode which allows players to gradually work on their skills. The cabinet also comes with a digital camera built onto the header - designed so players can take their photo once they have passed all levels. DJ Master is a music game where you take on the role of a DJ. It features over 40 songs, and is presented beautifully with a 32 inch widescreen LCD monitor. The game is suitable for 1 or 2 players, and is controlled by colourful buttons and a foot pedal. The game features 5 difficulty levels, with modes including single mode, PK mode, and cooperation mode which allows players to gradually work on their skills. The cabinet also comes with a digital camera built onto the header - designed so players can take their photo once they have passed all levels.